Much like their manhole covers and Kit Kats, Japan shows no signs of limiting their creativity when it comes to ice-cream flavours, especially when it comes to major premium brand, Haagen Dazs. As I discovered on my recent Japan trip, their flavours are exotic as they are unique to the country. First up were the floral duo, Sakura and Rose flavours that was released to celebrate Haagen Dazs Japan's 30th anniversary. Earlier feedback over social media had reported the rose flavour coming off as 'like eating rose-flavoured shampoo' while the Sakura edition bore no resemblance to the subtle scent of cherry blossoms at all. Admittedly, I was a bit apprehensive about trying the damask rose flavour at first as the top layer of plum sauce reminded me too much of lip gloss. But once I dug in, I found myself enjoying the sweet fruity taste of the ice-cream. If anything, it tasted similar to strawberry but with a flowery aftertaste. The Sakura on the other hand was less sweet but no less a treat. The Japanese have worked miracles with their iconic flower and Haagen Dazs Japan has done it justice by streaking ribbons of cherry sauce through the sakura-flavoured ice-cream. For something more classical and less floral, Haagen Dazs Japan also has the special edition Opera and Forêt Noire flavours. Coffee fans will love the Opera with a top layer of coffee sauce to complement the buttercream ice-cream underneath it. But the surprises doesn't stop there as the bottom layer was chocolate. This ice-cream wasn't just about the flavours but a close presentation to the cake it was inspired after. Forêt Noire ice-cream was a treat to the eye as it was a treat to the tastebuds. Because as soon as you open it, you are immediately greeted by this elegant design of heart on this unpretentious dessert. Beneath was chocolate ice-cream that was infused with chocolate sponge cake and real Kirsch-flavoured cherries that gives it a nice chewy texture. With this mix of flavours and texture, this small cup of ice-cream had definitely gone beyond the expectations of just an ice-cream. It's elegant, refined. classy and delicious. Even in the cold spring night. 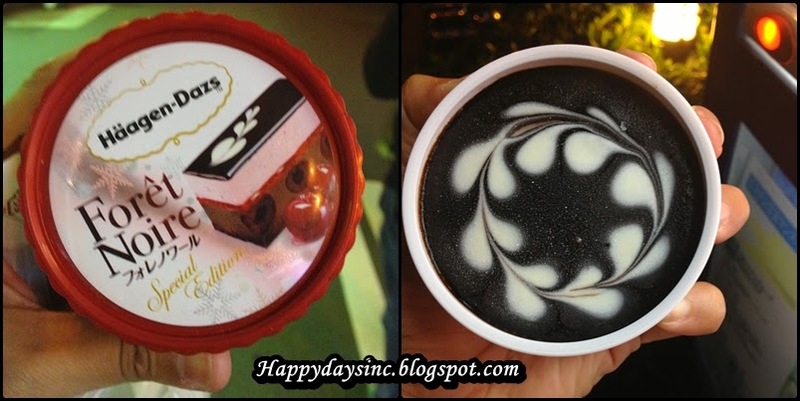 Now Haagen Dazs' Japonais didn't quite cut it for me,mainly because I don't like red bean. But my cousin loved it. The top layer was red bean sauce as was the middle layer that cushioned the green tea and vanilla ice-cream layers. There was a sixth flavour I spotted at Lawsons which was the Murasaki Imo (sweet potato) but didn't get a chance to try. It sold out when I came back to buy it the next day. Oh well. There is always next time. Hunting Haagen Dazs in Japan has become my new on-the-go activity alongside manhole cover spotting and Kit Kat hunting.